Warner Bros says that it is proposing to release 'day and date' (where this term comes from I don't know, but it means 'on the same day') The Curious Case of Benjamin Button in just about all possible formats on 3 June 2009. That is, it will be released as a DVD, and as a Blu-ray, plus Foxtel Box Pay Per View, iTunes, Bigpond and, says Warner, 'the online presence of various rental chains'. One of the official reasons is: 'we are offering a legitimate alternative to piracy'. Sounds like a good idea to me. I don't like the idea of Pay Per View, not the various on-line distribution mechanisms. But I'm all in favour of customer choice. Offer it all ways and let customers choose the format that best suits them. A member the public has written to one of my editors asking, in short, what is '600Hz sub fielding'? The editor passed it on to me, and my initial thought was: 'I have no idea'. Fortunately our correspondent quoted some material he'd found on the Web. So I did a bit of googling around myself and found that this seems to be a Panasonic technology for its plasma displays, and was preceded by a 480 hertz version, which Panasonic named its '480 Hz sub-field drive'. This version is described here. It seems likely that the only difference between the two is that the 600 hertz version does more of the same. A standard video signal is actually a series of still images, flashed on screen so quickly that we believe we are watching a moving image. The typical frame rate used in North America is 60 frames per second (60Hz) meaning that a TV would display 60 individual still images every second. 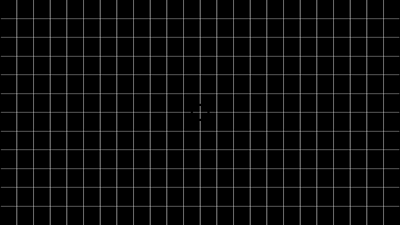 Sub-field drive is the method used to flash the individual image elements (dots) on a plasma panel. For each frame displayed on the TV the Sub-field drive flashes the dots 8 times or more, meaning that the dots are flashing 480 times per second (480Hz) or more. (Example: 60 frames per second x 8 sub-fields = 480 flashes per second). Underneath that is a wonderfully ambiguous graphic. It shows six picture frames. Underneath this row of frames it says 'Each Original Frame has Over 8 Sub-fields. 480 Hz Sub-Field Drive (information is changed at each dot 480 times per second, or more)'. Underneath each of the frames is a set of eight rectangles, each with a letter. Under the first frame the latter is 'A' in each of those eight rectangles. Under the second it is 'B' and so on. So the caption for the graphics implies that the 'information is changed at each dot' eight times per frame or more. But the little rectangles imply that the information stays the same. So what are we to make of this? First, 'field' in this context would mean video field. 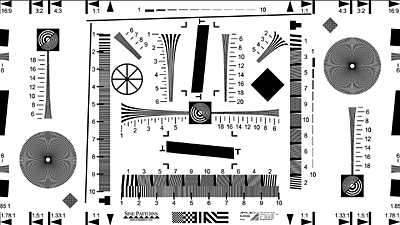 An interlaced video frame consists of two fields. In reality, in the US system, most of the time the picture consists not of 60 frames per second, but either 24 or 30 frames per second. But, absent Blu-ray, this is delivered in the form of 60 fields per second. A field is half a frame. One of the fields consists of the pixels in every second row of the frame, while the other field consists of the rest of them. More about that here. So 'sub-field' would mean 'below the level of the field'. Given that a field is largely a time-based object, a sub-field only occupies part of the time taken by a whole field. In the case of a 480 hertz sub-field, that is one eighth of the time (60/480 = one eighth). Now, what follows is my guess work. I shall ask Panasonic to cast an eye over it and let you know in due course if they agree. Unlike LCD TVs, plasma TVs work by stimulating some gas, which emits ultraviolet light, which in turn excites some coloured phosphor, which then glows. Compare with CRT TVs: these shoot electrons down a vacuum tube, which excites some coloured phosphor, which then glows. CRT TVs from the early part of this decade had a problem: they were called on to handle different signal frequencies, and their method of operation didn't lend itself readily to the task. Here's what happens when you excite some coloured phosphor, whether with electrons or with UV light. Its light output ramps up very rapidly, and once the stimulation ceases, it fades away, somewhat more slowly. With CRT TVs, each phosphor sub-pixel (a red, green or blue dot) was hit just once by a quick spurt of electrons. The electron beam would move on that the sub-pixel would have to wait for the next frame, one twenty-fifth of a second later (or one thirtieth in the case of US TV) before it would be refreshed. Ideally, this would have gone to a suitable output level instantaneously and maintained its brightness until the briefest of instants before the next spurt of electons came its way, switching off instantly and fully just before that moment. What in fact happened was it would ramp up to full brightness extremely quickly, and then immediately start to fade. The precise rate of fading could be affected by the selection (and presumably processing and treatment) of suitable phosphors. If you had a CRT TV that refreshed itself every 25th of a second, then it would need phosphors that lasted a relatively long time. But the 100Hz TVs that appeared in the late 90s and early 2000s needed to have their phosphors die out in half that time (1/50th of a second), clearing the pixel for the next frame. Some CRT TVs ran at 100Hz for standard definition signals, but could also handle high definition, in which case they would drop back to 50Hz. I hated HD on those TVs because it would flicker. The rapid fading of the phosphors, selected for 100Hz operation, meant that the pixels would fade noticably before each new frame. Plasma TVs have basically avoided this problem. Until now I had assumed that it was because they would excite the phosphors in a pixel, and just keep on exciting them until shortly before the next frame was due. Now, with a bit if research, it is becoming clear what I should have realised earlier: Each pixel is refreshed a number of times during the 25th or 30th or 24th of a second occupied by any given frame. This has a number of advantages. One is that it saves power: instead of maintaining a constant 'on' pixel, a pulse is provided to kick it on, and then further pulses to maintain its on state are provided as needed. 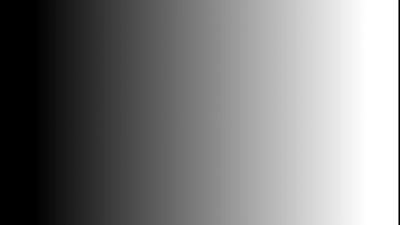 Second, by using a short duration phosphor, chosen according to the pixel refresh rate, you can have a rapid turn-off of the pixel at the end of the frame display period, allowing the new frame's pixel information to replace it with the very minimum of a 'black' period between the two frames. These TV engineers really are very clever. Presumably, then, a slower than 480 hertz refresh rate used to be employed. When Panasonic went for 480 hertz, then it became something to boast about. 600 hertz makes it even more boast-worthy. But the reason would seem to be not what happens during the display of any given frame, but how quickly it can change frames when the time comes. A quick change means more precisely defined motion. In the previous post I asked at the end: 'Is 24 bits it worth it?' I want to do an extensive post on this in due course, but let me first make my point briefly. In that previous post I contrasted the 2032kbps average bitrate of the Australian (and UK, I learn) version of Slumdog Millionaire against the 3962kbps of the US version. Our version is 16 bits; their version is 24 bits. I point out that to go up from 16 to 24 bit uncompressed PCM requires a 50% increase in space. But this increase in DTS-HD Master Audio requires a 95% increase in space. The nice thing about Slumdog Millionaire is that it is likely identical sound, aside from the bit depth, making it highly comparable. But to confirm, I have eleven other Blu-ray movies with English language 5.1 channel DTS-HD Master Audio sound with 16 bits of resolution. Their average bitrates range from 1834kbps to 2504kbps, and the average of the eleven is 2114kbps. I have four Blu-ray movies with English language 5.1 DTS-HD Master Audio sound with 24 bits of resolution. They range from 3849 to 4530kbps and average 4253kbps. That figure is twice (2.01x) the average bitrate for the 16 bit movies, so that basically confirms the drop-off in efficiency with the compression algorithm when moving from 16 bit to 24 bit sound. Double check and repeat the process with the Dolby TrueHD tracks I have scanned (omitting Gandhi and Gigi, because they are both pre-5.1 channel days even though they are rendered this way on disc). I have fourteen 5.1 channel movies with TrueHD in 16 bits and these range from 1376kbps to 2172kbps, and average 1668kbps. The seven equivalents in 24 bits range from 2535 to 3525 and average 3109kbps. That's an 86% increase in size. This has led me to think that there is actually limited value in using 24 bit sound. In brief: the efficiency of lossless compression systems like DTS-HD MA and Dolby TrueHD depends, amongst other things, on the predictability of the data. The severe drop-off in efficiency when you go from 16 to 24 bits suggests that most of those extra eight bits are unpredictable. The most likely reason for the unpredictability is that their values are largely random. Random samples are noise, pure and simple. White noise to be precise. Looking at it from another angle, the noise floor of the microphones used to record stuff is typically -96dB or higher, and actual (rather than nominal) signal to noise of much equipment would rarely be more than 96dB. The 17th bit on a 24 bit scale is at -96dB. It isn't surprising that the bottom eight bits of 24 bit sound should mostly be noise. I've just been analysing the new Blu-ray release of the 1958 musical Gigi. This gets Dolby TrueHD 5.1 channel sound for the English track, backed up with Dolby Digital 5.1 at 640kbps. Foreign language audio is provided in French, German, Italian and two varieties of Spanish (Castellano and Español). All of those are in mono, Dolby Digital 1.0, no less, with a bitrate of 192kbps. Except for Español, anyway. It, also, is in Dolby Digital 1.0, but its bitrate is a massive 640kbps! I suspect someone may have pressed the wrong button in the mastering suite. While examining The Fifth Element I noticed that there was a one minute long video file on the disc, with no apparent linkage from the menu. 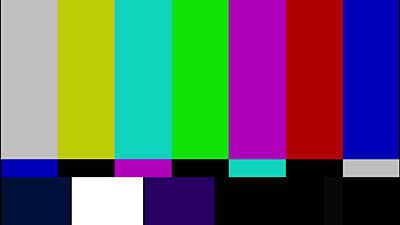 So I dragged it into a video player and discovered that it was a set of four test patterns, shown below (although they are of course delivered with a resolution of 1,920 by 1,080 pixels). They were being delivered at a health 15,013kbps in MPEG2 format. Each appears for fifteen seconds. That triggered a memory, and a quick bit of googling determined the code: 7669. That is, when the main menu is showing, you key in that string of digits on the remote and this starts the test patterns running. Something I read suggested that this applied to all Sony Blu-ray discs. So here I am, as I am typing this entry, I'm checking them all one by one. So far I've done 24 and every single one of them has this set of test patterns, accessible the same way, except for a couple of US imports (The Terminator, and the original version of The Fifth Element), which have two minute test pattern tracks with four additional patterns. UPDATE: (Sunday, 5 April 2009, 10:32 pm): I've checked all 58 of the Sony Blu-ray discs I have here. Every single one of them has this ... except for three: Across the Universe, Almost Famous, and Good Luck Chuck. Every Australian disc has the one minute version. All three of the US discs (mentioned above, plus the Sony version of The House of Flying Daggers, have the two minute version. What a strange difference! UPDATE 2: (Monday, 6 April 2009, 11:12 pm): Craig from Channel 9 reminds me that, of course, 7669 isn't just some arbitrary number. It is the telephone keypad sequence for typing 'SONY'.